The Miami Five are Gerardo Hernández, Ramón Labañino, Antonio Guerrero, Fernando González and René González, five Cubans unjustly imprisoned in US prisons in 1998 for trying to prevent terrorist attacks against their country. For more than 40 years, right wing Cuban exile groups based in Miami have killed almost 3,500 people in terrorist attacks against Cuba, with the complicity of the CIA and US government. The US government repeatedly failed to act against the perpetrators of such crimes, including the blowing up of a Cuban airliner in 1976 (killing 78 people) and a bombing campaign against Cuban tourist hotels in the 1990s (killing an Italian tourist). But instead of arresting the terrorists, the US government arrested the five anti-terrorists on 12 September 1998 in Miami, where they were illegally held in solitary confinement for 17 months. Furthermore, in June 2011, a Freedom of Information request revealed that the US government had secretly paid journalists to write prejudicial articles in the media at the time of the trial and therefore undermined the defendants’ entitlement to a fair trial. Two of the prisoners wives, Olga Salanueva and Adriana Pérez, were also refused visas on ten separate occasions and denied visitation rights for more than ten years. 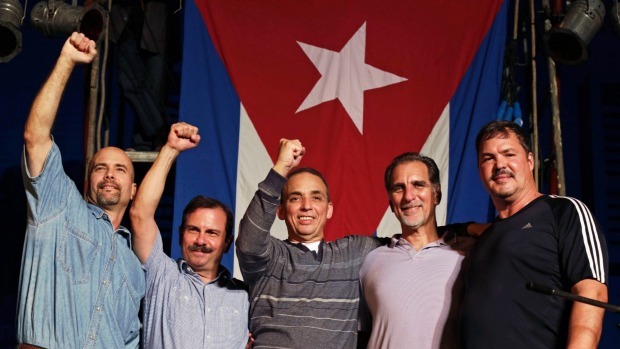 The international campaign for freedom and justice for the Cuban Five was supported by world leaders, Nobel prize winners, religious and human rights groups, lawyers, parliaments, trade unions, writers, academics, and thousands of people across the globe. 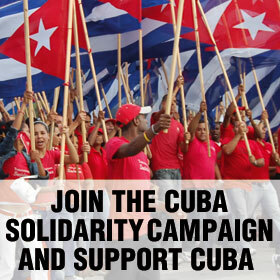 In 2014 the Cuba Solidarity Campaign was a key organiser of the International Commission into the Case of the Miami Five which took place at the Law Society in London. Full details of this event can be seen here. On 7 October 2011, René González became the first of the Miami Five to be released from jail after serving his full term. Conditions of his parole meant that he was forced to remain in Florida and denied visits from his wife for a further 19 months. However, in May 2013 he was given permission to return home to Cuba by renouncing his US citizenship. In February 2014 Fernando González also completed his sentence and returned home. In December 2014 as a result of the international campaign and talks between Cuba and the US the final three prisoners were released early as part of a prisoner exchange. Since their release the men have visited several European countries including France, Spain, Portugal, Norway, Russian and Sweden, plus South Africa, Namibia, Angola, Venezuela, Nicaragua, El Salvador and Ecuador. However, the British government refused them a visa to visit the UK. 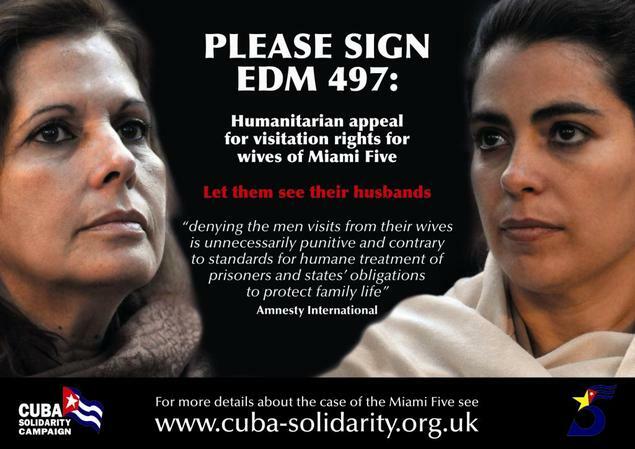 The Cuba Solidarity Campaign was involved in a legal appeal against this decision which saw resulted in the court overruling the government decision and has opened the door for the Miami Five to visit Britain in July 2016.